I am honored to be the messenger for this group angel reading for February 2019. We are reminded to clear the slate. Clearing debts in your life will help you to move forward and attain your highest good. We are reminded that debts are not just financial. Clearing our emotional debts is very important in order to be happy and enjoy the life you deserve. You are also reminded that your health is improving in the near future. Health, like abundance, comes in many forms and most of all it is a feeling. You can choose how you feel. The angels want you to know that you are attracting the romance you desire and to remember that passion occurs at a soul level, not just in physical form. 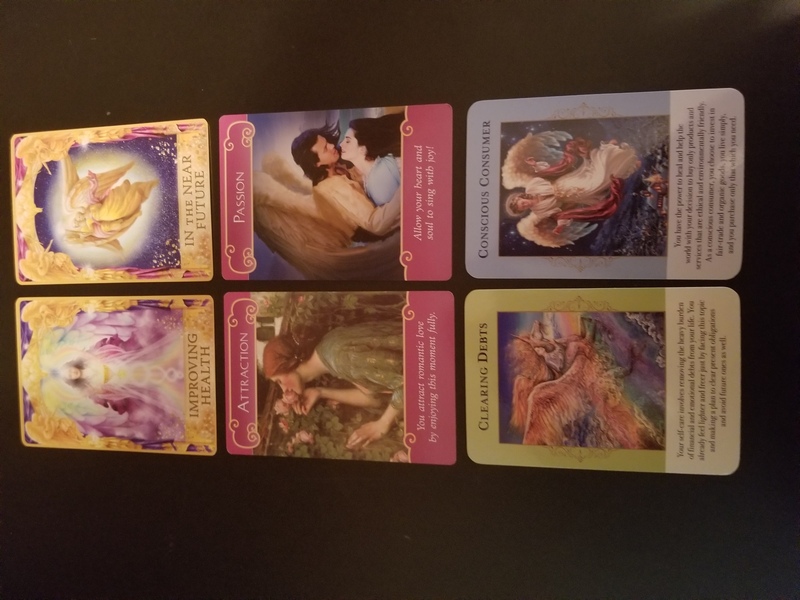 Before each reading, I connect with God, my angels, and guides, as well as all angels and guides of this community to deliver the most valid and useful information for your highest good. You will know what resonates with you, whenever you choose to listen. Anyone who is meant to hear these messages from the angels will listen to the show when the time is right for them. It’s all about divine timing. As a Certified Angel Card Reader, I am honored to serve as an instrument passing on information the angels have for you. These messages may be in regard to a particular question or simply guidance as you move forward in this life. I have attached an image of the angel cards from this reading. The link is below. The Gift of Choice, hosted by Bonnie Groessl brings you insights and inspiration to live the life of health, happiness, and abundance. CLICK HERE to donate to “The Gift of Choice” show.